Description: Be prepared for any outdoor adventure with this expansive BBQ tool set. 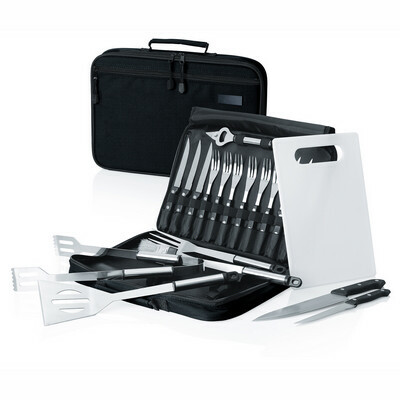 Featuring a 6-person stainless steel cutlery set, BBQ fork, spatula, tongs, marinate brush, two large knives, bottle oPenr, and bread board.. all contained within a heavy duty, padded, 600D polyester carry case. This set makes a fantastic gift and a high class promotional tool. Colours: Black. Materials: Stainless Steel, Polyester / 600D Polyester bag. Decoration Method: Pad Print, Engrave. Price includes : Printed - 1 col, 1 pos. Setup is included.